Feature a 10/30 ground joint and Celsius scale. 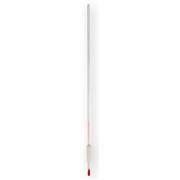 Each thermometer is calibrated for specific immersion depths. 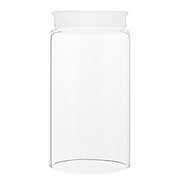 They contain red organic liquid against white back glass. Standard taper flask length joints, both inner and outer member. 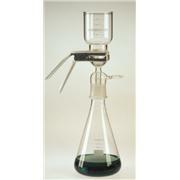 Part number CG-125-09 is used as a replacement neck for two liter Squibb style separatory funnels. Inner joint with a sealed on lower tube extending 6in below the grind. 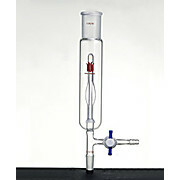 Borosilicate, with penny head Conforms to ASTM Standard E 675 Size Standard Taper 13 has solid plug; size Standard Taper 38 has recessed bottom Standard Taper designation indicates the approximate diameter of the ground zone at its widest (gauging) point. 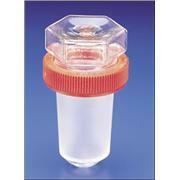 Glass standard taper and spherical joint adapters featuring a vertical ground glass sidearm. The sidearm is used to make tube compression fitting connection to a wide variety of flexible and rigid tubing using our 12709,12711,12715 & 12716 product families of fittings. 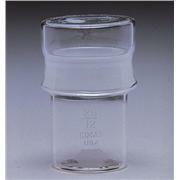 Glass standard taper and spherical joint adapters featuring a right angle ground glass sidearm. The sidearm is used to make tube compression fitting connection to a wide variety of flexible and rigid tubing using our 12709,12711,12715 & 12716 product families of fittings. 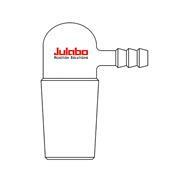 JULABO Reaction Solutions heavy walled glass inlet / outlet adapters with standard taper ground glass joints and 90° 3/8" single or dual glass hose barbs. 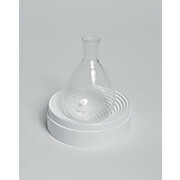 For connections to glass apparatus to supply vacuum, pressure, venting or gas supply. Interchangeable ground joint bearing with top lubricant well for use with our precision ground stirring shafts (8068,8070,8071,8073, 9532,9533). Recommended top stirring speed with our 8117 Stir-Lube is 1500 rpm. 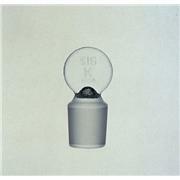 Glass standard taper and spherical joint adapters featuring right angle tee ground glass sidearms. The sidearms are used to make tube compression fitting connections to a wide variety of flexible and rigid tubing using our 12709,12711,12715 & 12716 product families of fittings. 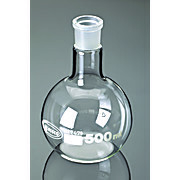 Heavy wall recovery flasks are ideal for use with rotary evaporators. 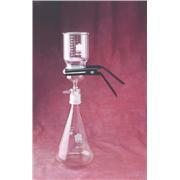 Flasks feature a square bead and a single neck with ground glass 24/40 joint. 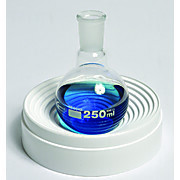 Opening at top is designed for easy recovery of reaction products using a spatula. Flask bottom fits standard heating mantles. 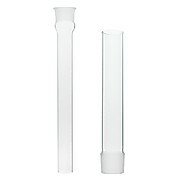 Glass standard taper joint adapters featuring a drip tip and a right angle ground glass tube sidearm. The sidearm is used to make tube compression fitting connection to a wide variety of flexible and rigid tubing using our 12709,12711,12715 & 12716 product families of fittings. 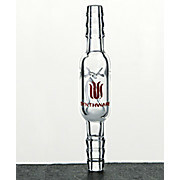 Glass standard taper joint adapters featuring a drip tip and right angle tee ground glass tube sidearms. The sidearms are used to make tube compression fitting connections to a wide variety of flexible and rigid tubing using our 12709,12711,12715 & 12716 product families of fittings. 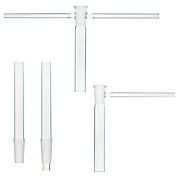 Glass standard taper joint adapters featuring a drip tip and a vertical ground glass tube sidearm. The sidearm is used to make tube compression fitting connection to a wide variety of flexible and rigid tubing using our 12709,12711,12715 & 12716 product families of fittings. Glass joint, inner ground with ring on shank for use with threaded outer member or outer member with external thread for use with inner member.O-Ring and cap to form a leak tight-seal. 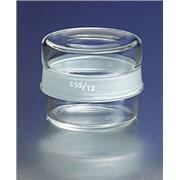 For cap, see 7616; for O-Ring, see 7617. 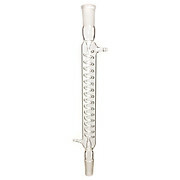 These borosilicate glass straight bore stopcocks with straight sidearms include stopcock plugs and barrels that are ground to interchangeable Standard Taper specifications. 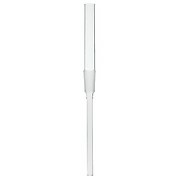 Plugs (also sold separately) are solid and have a 1:10 taper.